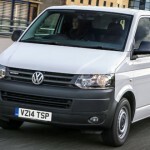 More than two-thirds (70%) of van drivers have taken time off work due to back pain – costing the UK economy on average £21 billion per year, according to a Volkswagen Commercial Vehicles survey. 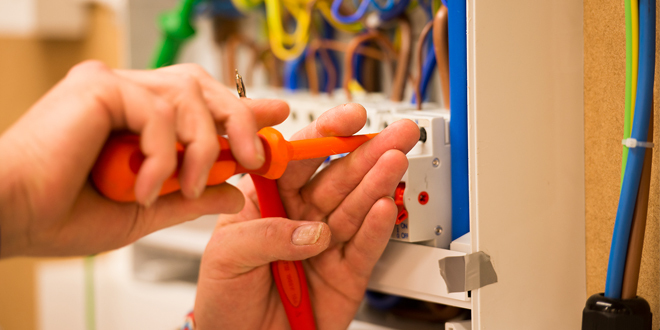 Drivers who suffer from ‘Builder’s Back’ take an average of three weeks off work and the resulting downtime costs companies an estimated £500 a day per van. Poor seat adjustment could be to blame for triggering back issues, especially as many drivers spend up to seven hours a day in their vans. During a day’s testing spent at Cordwallis Van Centre, Heathrow, Volkswagen Commercial Vehicles and a chiropractor from the BCA discovered that while half of van drivers say that they adjust their seat to the correct position, two-thirds are still sitting incorrectly or missing crucial steps. Although most drivers adjusted their seats before driving, many committed common mistakes of positioning the seat too close to the steering wheel and angling the seat too far back. Prab Chandhok, chiropractor and member of, British Chiropractic Association, commented: “Many people now point to driving as a trigger for their back or neck pain, so it’s really important that your van is set up properly for your needs, to help ease the strain that driving – especially for long periods of time – can have on your back and neck. 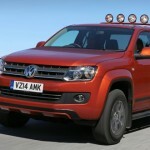 Sarah Cox, Head of Marketing of Volkswagen Commercial Vehicles, said: “Labourers commonly suffer from ‘Builder’s Back’ for a variety of reasons but poor seating position can often be overlooked. Our research made it evident that the majority of drivers don’t adjust their seats correctly. The effect of this is not only causing over two-thirds of van drivers to suffer from back pain but also hits the UK economy with up to £21 billion in opportunity cost. 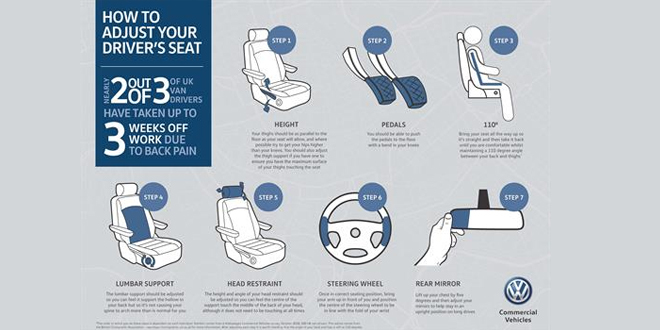 “We were delighted the BCA were on hand to help us during our testing at the Cordwallis Van Centre and to provide us with some top tips to ensure drivers are able to understand the correct way to adjust their seats and avoid back pain. Volkswagen Commercial Vehicles, aware that many customers spend up to seven hours a day in their vans, aims to create a workplace that is as comfortable as possible. 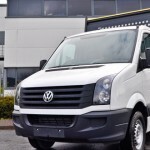 The Volkswagen Crafter offers both ‘ergoComfort’ and ‘ergoActive’ seats, allowing van drivers to individually adjust their seats for an optimal driving position. The Volkswagen Crafter’s ‘ergoComfort’ suspension seat features optimal back care with up to 20-way adjustment. The suspension seat softens unpleasant bumps and jolts which can jar a driver’s back. The ‘ergoActive’ seats, equipped with next generation seat foam, offers 14-way adjustment, including a massage function, with back-friendly ergonomics that ensure the hours spent behind the wheel are as pleasant as possible. 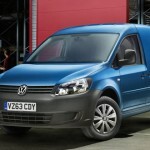 For more details on Volkswagen Commercial Vehicles’ multi-award-winning products and services, or to find out more about the Van Centre network, please visit www.volkswagen-vans.co.uk.